The stained glass windows are a major feature of Old St Paul’s, and many were donated as gifts or as memorials. The London stained glass window firm Lavers and Barraud made most of the windows in St Paul’s. The firm was established by Francis Barraud; his brother Charles Decimus Barraud had emigrated to Wellington and was an artist, pharmacist, and a long-term St Paul’s congregation member. The congregation sent back orders to Lavers and Barraud, and they were sent over packed in crates from London. The two exceptions are one pair of windows made by a German studio, and the Shirtcliffe window, made by Whitefrairs, London. Below is a list of all the windows at the church, with links to stories on the ones we’ve written about so far. More to come later! Window donated in 1874 by W.H. Davies, a photographer who lived opposite Old St Paul’s. See the story about Davies’ window. Christ Blessing the Children – in memory of Mrs. M.A. Swainson, teacher and founder of Samuel Marsden Collegiate School for Girls. The window was given by her pupils and was installed in 1898. See the story about Mrs Swainson and her school. 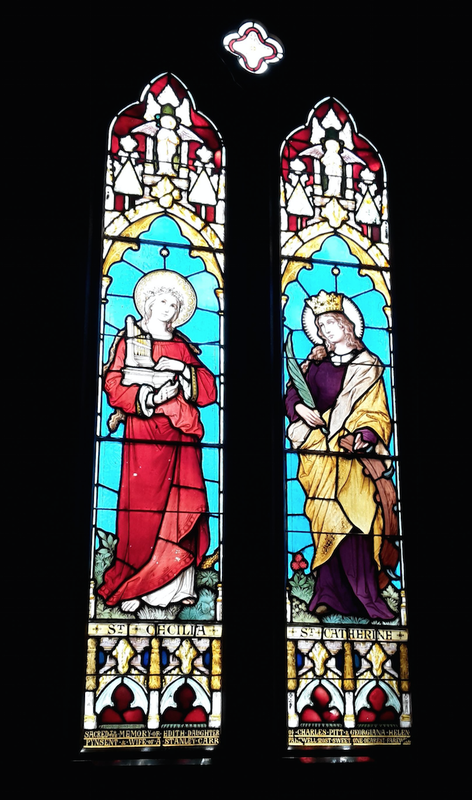 St Cecelia and St Catherine – in memory of Edith Carr and installed in 1898. These two windows are from a German studio, Mayer and Company. See the story about Edith and this window. The People’s Window – subscribed for by the parishioners in 1896. The people gave according to their personal circumstances and a total of nineteen pounds was raised. Christ and St Peter – for the Rev Harvey (the third vicar at St. Paul’s), installed in 1889 after his death. See the story about Reverend Harvey. The Transfiguration – A trefoil window in the North Minor Transept. The Sanctuary Windows – the earliest in the Church. Tradition says that Mrs Abraham gave the cruxification window, and Bishop Abraham the others, but there appears to be no documentary proof of this. See the story about the Sanctuary windows. 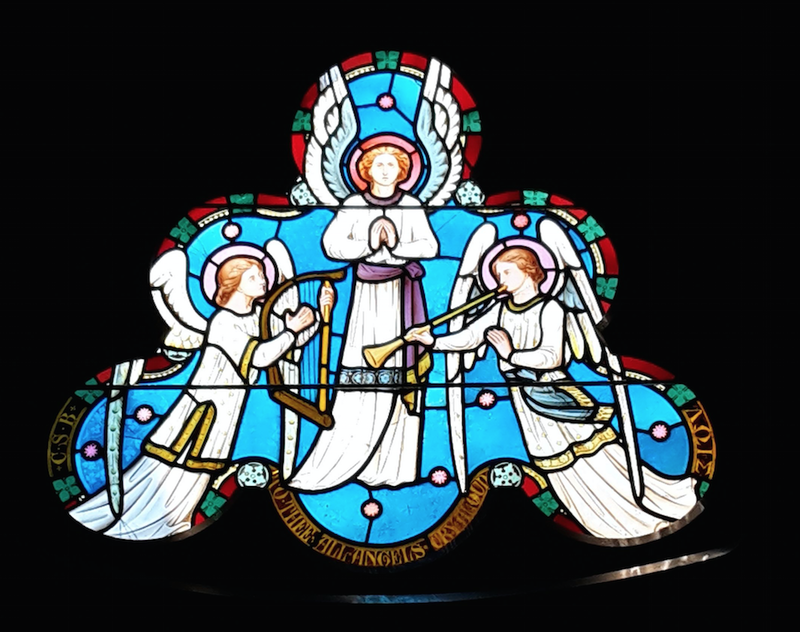 To Thee all Angels Cry Aloud – A trefoil window in the South Minor Transept. St Luke and St Mark – in memory of Dr. Mark Kebbell (member of the Royal College of Surgeons) installed in 1867. See the story about the Kebbell window. Christ with Martha and Mary – in memory of Rosalie Matson, a prominent singer and installed in 1908. The Good Samaritan – in memory of William H. Levin M.P., founder of the firm Levin and Co and the first President of the Wellington Harbour Board. He died in 1893 and the window was installed in 1897. See the story about the Levin Window. Joshua and the Centurion – in memory of Major L.M. Levin (died 1886), son of William and was installed in 1887. See the story about these windows here. Resurrection Morning – in memory of Jane Barbara Shirtcliffe (died 1926) and installed in 1935. This was the last new window to be installed. It was made at Whitefriars, London by Powell and Sons. See the story about the Shirtcliffe window. South Aisle Windows, donated by parishioners and installed in 1877 and have the same pattern as the Baptistry and Clerestory windows with Fleurs de Lys (representing The Holy Trinity) and Roses (representing England). St Paul’s Conversion, and St Paul and St Barnabas at Lystra –The West window, given by the Wellington Veteran Corps. No 1, Porirua and Patea Rifles, in memory of Captain Buck and Lieutenant Holland, who died in the Taranaki War battle Te Ngutu o te Manu and installed in 1869. See the stories about the West Window and the story about the men it memorialises. Main image: Copyright Peter Shepherd. Other images: Elizabeth Cox.